Like every frequent flyer, you probably dream of finding the perfect suitcase for an affordable price. But you also probably realise that a great suitcase usually costs an arm and a leg…like a Samsonite. But it doesn’t always have to be that way! In this review, we’ll check out a particularly interesting luggage brand – IT Luggage. 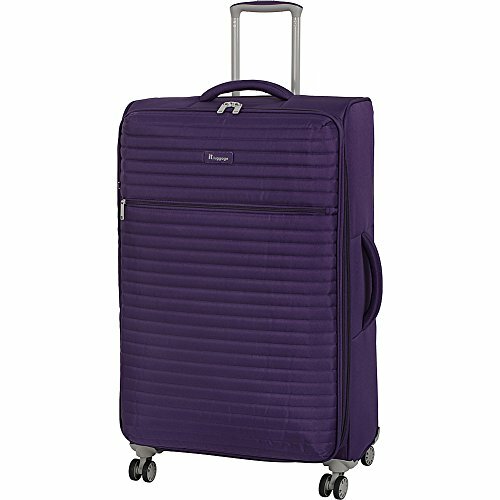 I have personally reviewed dozens of luggage brands on this site, so why does this one stand out? Well, they are one of the rare brands that actually strives to be creative in luggage design. Their frameless suitcases are the perfect example of that. As are their extra-wide handles. Intrigued? You should be. I always appreciate brands who try new things more than those who simply copy the high-end brands and stick to the same old things. So, let’s check out some of the best IT Luggage suitcases, and see whether or not they are worth your money. In this section, we will check out the top hardshell choices from IT Luggage. All of the suitcases that you’re about to see have great reviews from satisfied customers and they came out on top when compared to some other luggage from this brand. They obviously aren’t your only hardshell options, but they certainly are the best. 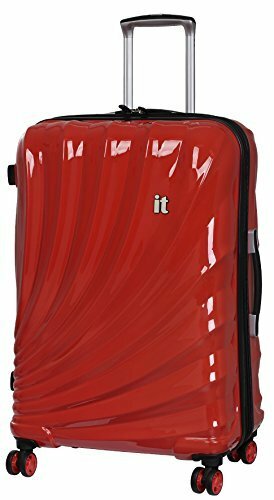 This IT Luggage suitcase is available in three sizes, as well as a value set. And honestly, it’s one of my favorites from their entire range. Why? Because it is a zipperless suitcase. I have said this already, and I’ll say it another million times – zipperless luggage is much safer than zippered luggage. That’s because anyone can break open your locked zippered suitcase with a ballpoint pen. Now, I do think that the design of this suitcase is a rip-off of the Rimowa Topas. But in a good way – the Topas is one of the best and most expensive suitcases that money can buy. If the IT luggage is even half as good as it, then it’s more than worth your money. And with the aluminum frame, 100% Polycarbonate construction and double spinner wheels, I think it comes pretty close. Polycarbonate is generally a pretty durable and impact-resistant material. But I really like the addition of the corner guards on this suitcase, since they make it even sturdier. And you will need all the sturdiness you can get if you want your suitcase to survive multiple flights. The interior of the suitcase is priceless – you get a divider with pocket(s) in each compartment, which allows for great organization. Just keep in mind that the capacity of the Crusader is not expandable, due to the TSA latch closure. So don’t go crazy with souvenirs on your trip – you might not have enough space for all of them. External Dimensions: 20.7” x 15” x 9.4"
Internal Dimensions: 18.9” x 14” x 9.4"
Internal Dimensions: 24” x 17.7” x 11.4"
External Dimensions: 30.7” x 21.9” x 13.8"
Internal Dimensions: 29.3” x 20.9” x 13.8"
The Apollo suitcase is one of the innovative pieces of luggage from this brand. It is made of Duraliton – an ultra-strong and lightweight material, which consists of two layers of Polycarbonate. And the specs of this luggage are proof of this, since these are some of the most lightweight IT Luggage products I’ve seen. 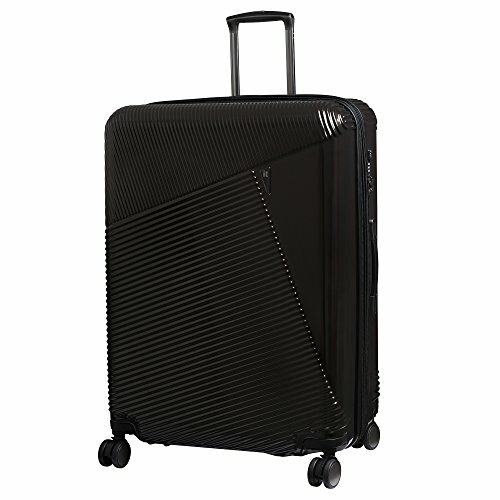 In addition to that, the Duraliton Apollo collection is equipped with double spinner wheels, which give you great maneuverability of your suitcase. And the telescopic wheel handle has a button that allows you to lock it into position when it’s fully extended. Overall, you can expect that wheeling these around the airport will be a piece of cake. One downside of these suitcases is that they don’t have any locks. So, you can’t have complete peace of mind when it comes to the security of your stuff. But you can always purchase a zipper padlock, if you feel uncomfortable buying luggage without a lock. The interior of the Apollo is fully lined, and it is divided into two packing compartments. The bottom compartment has elastic cross straps that are supposed to keep your clothes in place. And sadly, it doesn’t have any pockets. On the other hand, the top compartment has a full zippered divider, which sports a large mesh pocket and a smaller slip pocket. Which are some good organization features. The Autograph luggage collection is made of 100% Polycarbonate, so you can expect these suitcases to be really lightweight and durable. Additionally, the shell also features a ribbed design, which will make all the scuffs and scratches less noticeable. Especially if you get the suitcase in a darker color. Unfortunately, they don’t have reinforced corners. I find this to be an important impact-resistance factor, since the corners of your suitcases are often the first parts to get dented or broken. The material itself is sturdy enough that this shouldn’t happen, but you can’t be 100% sure that it won’t happen. But not to worry – in case the shell of your PC suitcase gets broken, you can easily repair it yourself. 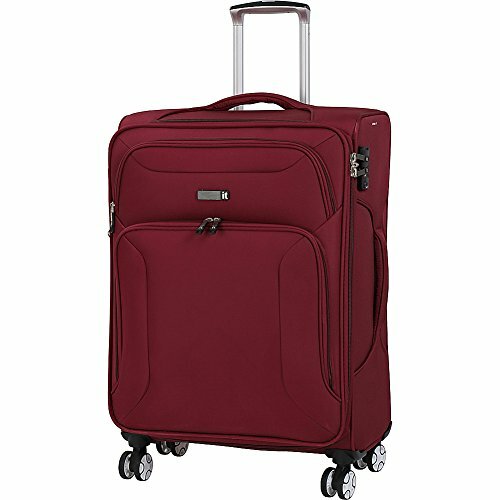 Other features of this suitcase include double spinner wheels, a retractable telescopic wheel handle, firm and comfortable grab handles and a TSA friendly combination lock. Overall, nothing really surprising there – just the features that you expect from any good hardside suitcase. Inside the Autograph you have two packing compartments. The bottom compartment has a small zippered pocket, as well as a pair of elastic cross straps that will keep your stuff in place. And in the top compartment you have a full panel zippered divider with a large mesh pocket. Oh and the capacity of these suitcase is expandable by about 3 inches, which is certainly a bonus. Dimensions: 29.8” x 21.1” x 12.6"
The Metamorphic suitcase has a very unique design of the shell. Which goes in its favor, since any scuffs or scratches your suitcase might get won’t be nearly as visible as they would on a smooth outer shell. And by the way, that shell is made of pure Polycarbonate, which speaks volumes about the durability and sturdiness of this suitcase. 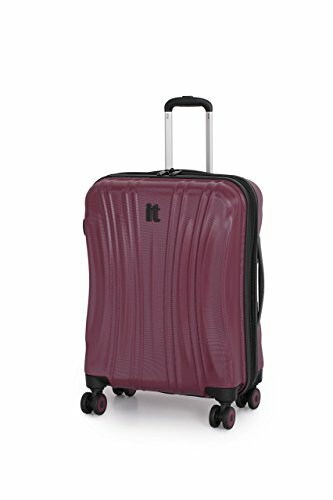 One thing I have to tell you is that there’s currently some ridiculous sale on Amazon – the smallest Metamorphic suitcase is 70% off right now. So, if you are interested in the suitcase, you definitely will not want to pass up that deal! And how could you not be interested in this lightweight hardshell with double spinner wheels, expandable capacity and a TSA friendly lock? 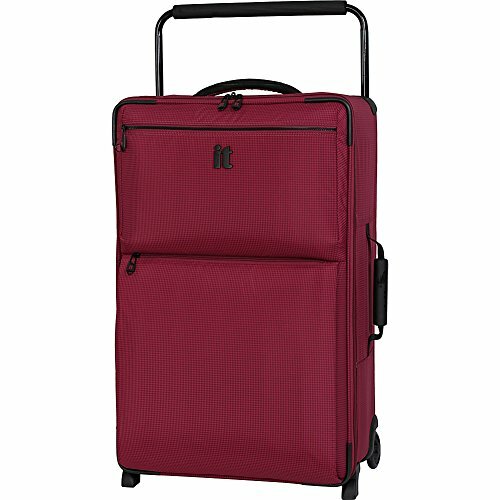 These suitcases are also equipped with telescopic wheel handles, which feature a push button that locks them into position. And also a pair of soft grab handles – one on the top and one on the side. When you open up this suitcase, you see that you have two packing compartment with a total of three pockets. Two are on the full-panel zippered divider in the top compartment, while one of them rests in the bottom compartment, and keeps company to the elastic cross straps. Nothing new and innovative there – but that’s not always a bad thing. Dimensions: 21.5” x 15” x 10.2"
Internal Dimensions: 19.3” x 14” x 10.2"
Dimensions: 27.2” x 18.9” x 11.4"
Internal Dimensions: 25” x 17.7” x 11.4"
Dimensions: 30.9” x 21.7” x 12.6"
Internal Dimensions: 28.9” x 20.5” x 12.6"
The Bolero suitcases feature a 100% Polycarbonate construction in a bunch of different colors. 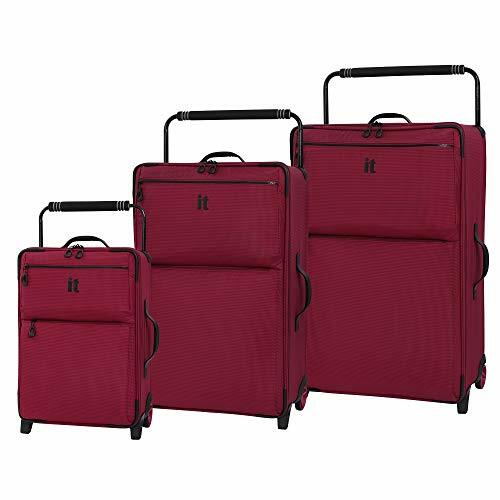 Well, the 3-piece set in particular is available in eleven different colors; the individual suitcases can only be purchased in one or two colors. 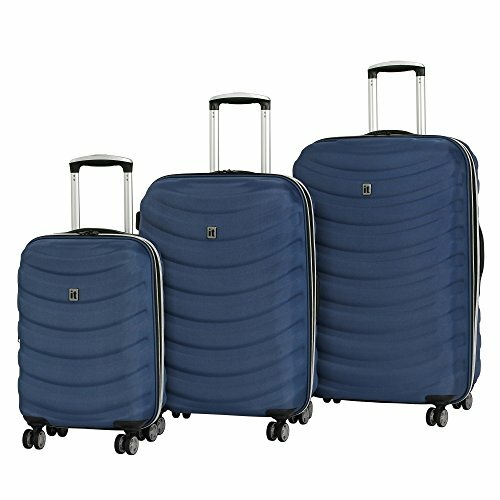 As for the features of these suitcases, all of them have double spinner wheels, a telescopic wheel handle with a locking push button and expandable capacity. Sadly, they don’t have any locks, so they’re not the best option if you want your luggage to be perfectly secure. The interior of the Bolero is divided into two compartments; the top compartment features a zippered divider with two pockets, while the bottom compartment has elastic cross straps and a small zippered pocket. Unfortunately, the information about the exact dimensions of these suitcases is not provided anywhere. But, you can get a pretty good idea based on their size – the smaller one is a carry on suitcase, while the larger bag would have to be checked. And judging by their weights, I would say that these are a really good choice – the 21.5” suitcase is the lightest hardshell carry on from IT Luggage so far. Additionally, I have to mention the great value of the Bolero luggage sets. Even though the individual suitcases are pretty affordable, each of these sets gives you great value for money. So, if you need more than one suitcase anyway, definitely consider getting a Bolero set. This luggage is particularly interesting due to its unique build. All of these suitcases features frameless construction, which means that even if they get dented, their shells will pop back. And that’s pretty awesome! You won’t have to worry about any scratches or scuffs on this IT Luggage. *Note: Currently, the two suitcase collections featured in this review are only available as value sets. No frameless suitcases can be purchased individually. Additionally, there is no information on their exact dimensions and weights. The Ionian Classic suitcases are pretty cool frameless suitcases. They are available in two designs – the classic grey, and the purple and pink Eiffel Tower design. I personally prefer the first one, since I am not a big fan of colorful luggage. But, the latter design will do a better job of hiding any damage this suitcase might experience. Honestly, if you didn’t know that these were frameless suitcases, you would think they were just basic hardshells. They have double spinner wheels, a TSA friendly lock, a couple of grab handles and a telescopic wheel handle. Pretty standard features. But these have the benefit of the “indestructible shell” – it can’t be scratched, dented or broken, which is pretty awesome if you ask me! The Ionian Classic also features two fully lined packing compartments with expandable capacity. The top one has a full zippered divider, with a mesh zippered pocket and a smaller slip pocket on it. The bottom compartment, on the other hand, features elastic cross straps. There are no pockets inside it. 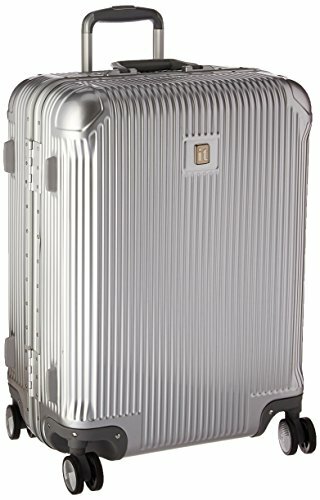 Overall, if you want to try out something new, I would definitely recommend these frameless suitcases. You kind of get the best of both worlds – the light weight and features of the hardshell, plus the durability of a softshell. And you wouldn’t have to worry about scratches and dents ever again, which is priceless! The Waveglider set is the better choice, in my opinion. That’s simply because it’s much more affordable, so you will get better value for money. Especially if you’ve never owned this type of a suitcase before, and are not sure whether you will find it a good fit. But there is one downside to this particular set, and that is the lack of locks on the luggage. If you can get over that, then I think you will really like these suitcases. For one thing, they are made of high-density EVA foam, which means they’re the perfect middle ground between a hardshell and a softshell. They have two packing compartments with a few pockets inside, which is my favorite feature of hardside luggage. And their expansion zipper is in the middle of the suitcase, between the two sets of wheels. Which means that the suitcase won’t get tipped in any direction when it is expanded – something that often happens with softshells. In terms of other features, these are equipped with double spinner wheels, a couple of sturdy grab handles and a retractable, double barrel wheel handle. And of course, the unscratchable shell – which is pretty much reason enough to give these a go. The softside suitcases from IT Luggage actually feature most innovative designs. So, that’s what we’ll mostly be talking about in this section. We will also check out their best regular softside suitcases, in order to cover as much of their range as possible. The Los Angeles suitcase is as glamourous as the city that it was named by. For one thing, these suitcases are surprisingly lightweight, with the carry on being under 5 lbs. And that’s impressive, especially if you consider that all the suitcases have a fiberglass frame inside. But, what is even better is that the LA collection features extra-wide wheel handles, which are more comfortable than the regular telescopic ones. I was never any good at physics, so I can’t precisely explain why that is. But it has something to do with how the weight of the suitcase is transferred to the handle when you’re pulling it around. And the wider the handle, the lighter the bag feels and the more comfortable you are. Which will certainly come in handy, since this luggage features plain in-line skate wheels that require you to tilt your suitcase and drag it around. Just like on other softsides, the LA suitcases have a single packing compartment. Which features tie-down straps and four mesh slip pockets on the top flap. In addition to that, you also get two external zip pockets, which are perfect for any stuff you want to have easily accessible. I love that – external pockets are pretty much the only reason why I still genuinely like using softshell suitcases. External Dimensions: 21.8” x 14.2” x 7.3"
The Megalite Fascia is a collection of sleek, softside suitcases. And, even though they aren’t really famous for their innovative design, they are equipped with some great features. Like the double spinner wheels and the TSA friendly lock. That’s right – these are the best softside suitcases for all of you who want to travel in style, but also knowing that your luggage is 100% secure. They are really lightweight, but definitely not lighter than the Los Angeles collection. However, these suitcases have expandable capacity – something that the previous collection was missing. There is a downside to this feature, though; the zipper for expansion is the front of the suitcase. Which means that when you decide to use it, there is a chance the suitcase is going to get bulky and tip a little to the front. Obviously, that ultimately depends on the amount of stuff you pack inside it. 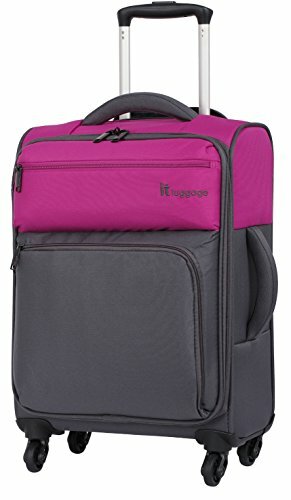 The interior of this suitcase features a single packing compartment with tie-down straps to keep your clothes in place. And there are also two pockets on the top flap, in addition to two external pockets. Overall, these are some really good suitcases for the price. They are easy to maneuver around, great for organization and they will keep your stuff pretty secure. And you thought you would have to make compromises on some of these features! The Debonair suitcases are like the perfect combination of the previous two collections. They are remarkably lightweight and have double spinner wheels, as well as the innovative wheel handle. I think the combination of those two features will make moving these around feel like fun, and not like a dreadful and painful task. Oh and the handles on these suitcases can be locked into position, unlike the ones on the LA luggage. The wide handle also means that you won’t have to deal with tubes sticking out inside the packing compartment. Which ultimately means more space for your clothes! You also get two tie-down straps inside, to keep all of your things firmly in place, as well as a large zippered mesh pocket. But it’s not all rainbows and butterflies. For one thing, the Debonair suitcases don’t have expandable capacity, and what you see is what you get. Additionally, they also don’t have any locks, so safety of your items is questionable. And if you ask me, I would have loved to see a couple more pockets for better organization. The Quilte collection is one of the best-selling softshell collections from IT Luggage. No surprises there, since these are really some top-notch suitcases. They are lightweight, have double spinner wheels, a retractable wheel handle and expandable capacity. And that is on top of their stylish design! The interior of these suitcases is fully lined, and the main compartment is pretty spacious. However, you will have to deal with the protrusion of the telescopic wheel handle inside it. Additionally, there is a large zippered pocket on the closure flap, as well as a large external zippered compartment for any last-minute necessities. Overall, in terms of organization, it’s a decent suitcase. Definitely not the best out of the bunch. And there are also some downsides to the Quilte. For one thing forget about a lock – you will have to get a padlock for the zipper pullers if you want your belongings to stay safe when you part with them. What’s even worse, the zipper for expansion is to the front. And the suitcase bulges when expanded, and goes over the front wheels. So, there is a good chance that it won’t be able to stand upright and that it will tilt to the side if you fully pack it when expanded. Dimensions: 21.5” x 14” x 8.5"
Internal Dimensions: 19.5” x 13.8” x 8.5"
Dimensions: 27.4” x 17.3” x 10"
Internal Dimensions: 25” x 16.9” x 10"
Dimensions: 31.3” x 19.3” x 11.2"
Internal Dimensions: 29” x 18.9” x 11.2"
The Duotone collection is also very popular. 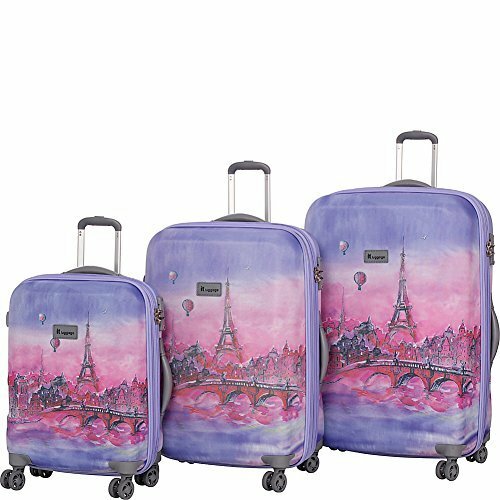 But unfortunately, I can’t tell you the exact specifications of these suitcases since they are not listed anywhere. I can, however, tell you that the smallest suitcase is 18” tall with the wheels and wheel handle, and that it’s the perfect size for a carry on. Since it is under 20”, you shouldn’t have any problem with bringing it inside the cabin on airlines all over the world. What I can tell you about these suitcases is that they are made of high density polyester, which is a pretty durable material. They are also equipped with single spinner wheels, a telescopic wheel handle with a push button that locks it into position and a couple of sturdy grab handles. Oh and a pair of zippered external pockets on the front of the suitcase, which will definitely come in handy to all of forgetful packers! The interior of the Duotone is fully lined and equipped with tie-down straps to keep your clothes in place. There aren’t any pockets inside the packing compartment itself, but there is a large zippered mesh pocket on the closure flap of the suitcase. Sadly, the Duotone luggage is not equipped with any locks, so you would have to take the security of your belongings into your own hands. And the capacity of these suitcases is not expandable, so pack wisely! Suitcases from this brand are actually pretty different from many others on the market. They have some patented features that are intriguing, at the very least. Like the really wide wheel handle, which makes it that much easier to maneuver your suitcase. Because, with an extra-wide handle, you don’t really feel the entire weight of your suitcase. Another interesting design innovation are their link luggage systems. These allow you to attach multiple suitcases to one another, so that you can wheel them around with just one hand. And I think that’s pretty useful – how many times did you find yourself in a situation where you literally needed an extra hand to get all your stuff from point A to point B? Duraliton is also one of their innovative materials. It’s basically just two sheets of Polycarbonate, which means that your Duraliton suitcase will be extra tough and durable. The age-old debate. But this time we have another fighter in the ring – the frameless suitcase. And honestly, I would probably get this one, just out of pure intrigue. I’ll tell you more about frameless in a later section. For now, you should know that these are suitcases that are made of thick foam, which offers great impact resistance. Plus, foam can’t really be broken – even if your suitcase gets dented, it will pop back to its original shape. And I think that’s a huge upside. A downside is that you can cut through it pretty easily, so it doesn’t guarantee the safety of your luggage. Now in terms of softshell vs. hardshell, it’s pretty simple. I generally recommend hardshell luggage for airplane travel, since it is more durable and impact resistant. Softshells are more likely to get squished or torn when faced with tough love from baggage handlers. But if you mostly travel by trains, busses or car, then a softshell is a good choice for you. You’ll have more space inside it, better organizational capabilities and you don’t have to worry about the weight of your suitcase that much. I would definitely suggest you check out some of their innovative softshells, since they really deserve a chance. Every suitcase has two dimensions – the internal and the external ones. The internal dimensions refer to the size of the packing compartment of your suitcase. On the other hand, external dimensions are the dimensions of a suitcase including the wheels and the handles. Airlines take the latter into consideration when determining whether to treat your suitcase as a carry on or as a checked bag. Now, the thing is that pretty much every airline has its own standards for a carry on suitcase. Some will accept your 24” suitcase inside the cabin, while others will make you check even the 20” one. If you want to be 100% sure that you will always be able to use your suitcase as a carry on (worldwide), I suggest you go for a suitcase whose external height doesn’t exceed 18”. Learning how to pack in so little space for longer trips is going to be a challenge, but it will save you a lot of money in the long run. IT Luggage offers 10-year warranty to all of their customers, which sounds amazing. But if you read the fine print you will see that the warranty applies only to manufacturing defects. Damage that your suitcase suffers in transit is not covered by the warranty, so it’s pretty much useless. Chances that you are going to get a suitcase with a manufacturing defect are very slim. And even if you do, great you can replace it. But chances that your suitcase is going to get scuffed/dented/broken on a flight are higher, and not even because of the quality of the luggage. It’s because of the way airline staff treats your luggage – and the manufacturers are well aware of that. Which is why the warranty doesn’t cover any damage airlines inflicted to your luggage. Now the (sort of) good news is that this is something most manufacturers practice. So, it’s not like IT Luggage is offering sub-par warranty. But, they do have sub-par customer service, so avoid contacting them unless you really need to. We’ve checked out a lot of suitcases in this review. And if you still aren’t sure what the best option for you is, here are my top three choices. Out of all the hardshells, I would say that the Crusader is the best option. That’s mostly because it’s the only zipperless suitcase, and I am a huge fan of zipperless suitcases. They are by far the safest luggage option, since they are pretty much impossible to break into. 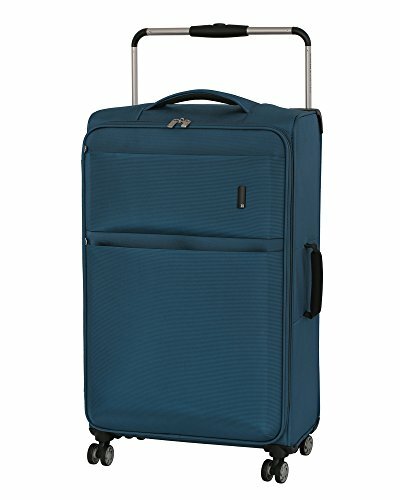 And this suitcase also features double spinner wheels, a retractable wheel handle, two dividers in the packing compartments, along with a bunch of pockets inside. Overall, it is my favorite choice. Ultra-secure aluminum frame- sturdy interlocking aluminum frame for the ultimate protection. Combination TSA Lock. Impact proof 100% PC outer! We only talked about two frameless suitcases, and I would definitely recommend the Waveglider. It is not the better option feature-wise, but it is the best value for money you can get, since it costs about half as much as the Ionian Classic. And the only thing that the suitcase lacks is a TSA lock. It has spinner wheels, a telescopic wheel handle, a couple of sturdy carry handles and the classic interior of a hardshell suitcase. But the EVA foam shell construction means that you will never have to worry about your suitcase getting scratched or scuffed again! How’s that for innovation? When it comes to softshells and innovation, I think that the Los Angeles suitcase stands out the most. I love the fact that its wide handle means that you get a more spacious packing compartment, since the barrels don’t protrude inside it. This luggage is remarkably lightweight, which is perfect if you tend to pack a lot of clothes whenever you go away. You might miss the spinner wheels and a TSA lock, but the attractive price tag makes up for them! And that’s it! 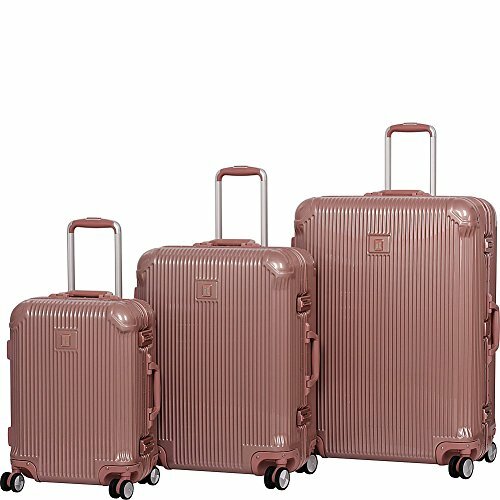 Overall these are some pretty good suitcases for their prices. Be sure to check those out on Amazon – most of them are currently discounted, so it’s the perfect time to try them out for a bargain!